Republican presidential candidate and former Massachusetts Gov. 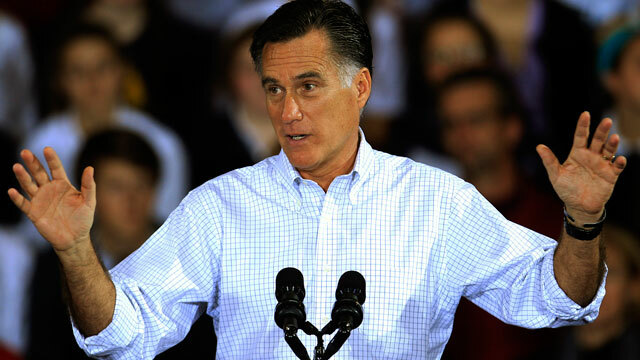 Mitt Romney speaks at a campaign event at Avon Lake High School Monday, Oct. 29, 2012, in Avon Lake, Ohio. Mitt Romney and the Republican Party's tremendous difficulty appealing to Latino voters dealt a significant blow to their chances of winning in 2012. Romney got off on the wrong foot with Latino voters early in the campaign. During the GOP primary, he took a hard line on immigration, endorsing the concept of "self-deportation" that would implement immigration crackdown policies to spur undocumented immigrants to leave the country on their own. The Republican candidate tried to moderate his rhetoric over the next several months, but the damage was already done. According to the national exit polls, Obama won 71 percent of the Latino vote while Romney won 27 percent. That's an improvement over Obama's 2008 performance when Latinos backed him 67-31 percent over Republican John McCain and the largest Democratic margin since 1996. To give you an idea of how badly the GOP's Latino support has eroded, just eight years ago, George W. Bush won around 40 percent of the Latino vote. Obama's standing among Latinos was even stronger in Mountain West states like Colorado and Nevada, which helped fortify his advantage in the electoral college. ABC News does not yet have enough information to project a winner in Florida, but Obama's historic performance among Latino voters there appears to be a factor in making it a close race. According to exit polls, the president won Florida Latinos 60-39 percent, more than his 57-42 percent margin in 2008 and the best performance for a Democrat since 1992. Unlike Latinos in western states who are primarily Mexican-American and place a high priority on the issue of immigration, Cuban-American and Puerto Rican voters comprise the bulk of Latino voters in Florida and generally are not as concerned about immigration status issues. While those voters do not necessarily have to deal with the immigration issue personally, the tone of the debate is still seen as a sign of respect to the community. Romney was able to keep things closer in Florida thanks in part to the bastion of Republican-leaning Cuban-American voters, but if the exit poll indication holds true in that state, it would be a stinging defeat for the GOP. The demographic trends shown in the exit polls that reveal an increasingly diverse electorate hamstrung Republicans in this election and also do not bode well for the party in future contests. The white share of the electorate in 2012 fell to 72 percent, its lowest level dating back to 1976. Latinos made up 10 percent of the overall electorate for the first time ever, according to exit polling. Those numbers defied the predictions of Republicans who believed the racial composition of the electorate would largely stay the same as it did in 2008. And Obama enjoyed a 58-percentage point advantage among non-white voters, allowing him to overcome his 18-point deficit with Romney among white voters. There also appears to be a growing consensus around the immigration issue. Almost three-quarters of Latinos said employed undocumented immigrants should be offered a chance to apply for legal status while 22 percent said they should be deported to their home country. A smaller, but still significant majority of all voters (64 percent) favored a path to legal status for employed undocumented immigrants while 29 percent said they should be deported, according to exit polls. Previewing what will likely be a lengthy internal debate in the Republican Party, politicos on both sides Tuesday said that the party needs to fix its Latino problem before it can win the White House again. "They took on the most extreme position in terms of self-deportation," San Antonio Mayor Julian Castro, the keynote speaker at the Democratic convention, said on NBC. "They alienated the Hispanic community more than they alienated them in quite a while." Castro said that the GOP "ought to do a real gut check on this." Florida GOP operative Ana Navarro tweeted this after the race was called for Obama: "Mitt Romney self-deported himself from the White House." +Do College Students Care About the Elections?